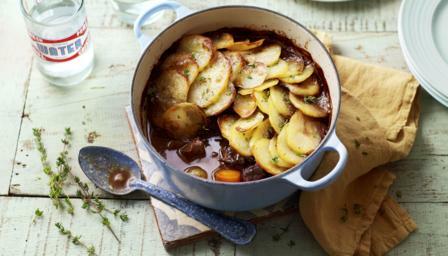 This hearty one-pot casserole is perfect for a chilly winter evening. Season the meat with salt and freshly ground black pepper. Add the onions and another knob of butter to the pan and fry for 2-3 minutes, or until lightly browned. Add the carrots and cook for a further minute. Stir in the flour then gradually add the red wine, stirring until smooth. Add the browned beef and the stock, season with salt and freshly ground black pepper and bring to the boil. Stir in the fresh thyme, then arrange the potatoes on top. Dot the surface with the remaining butter. Cover with a lid and cook in the oven for one hour. Remove the lid and increase the heat to 200C/400F/Gas 6 for 30 minutes.